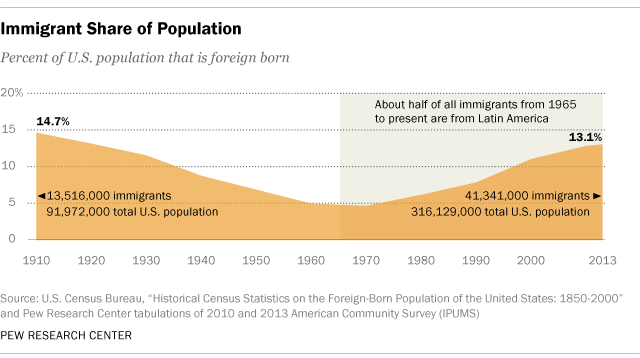 But today’s volume of immigrants is in some ways a return to America’s past. A century ago, the U.S. experienced another large wave of 18.2 million immigrants, hailing largely from Europe. 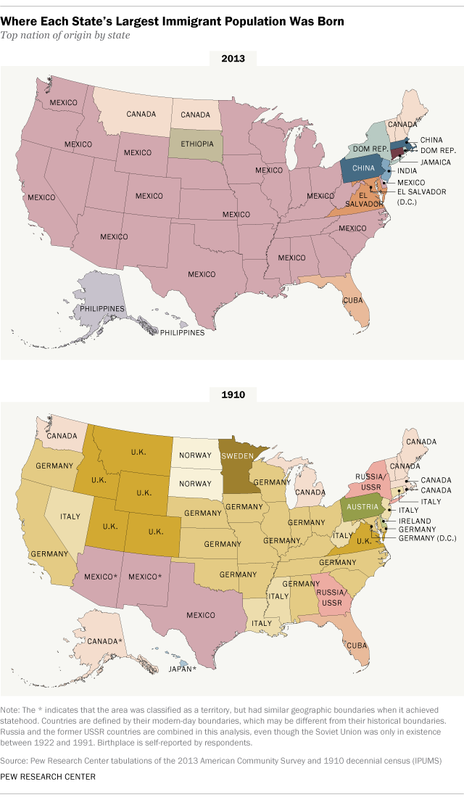 Many Americans can trace their roots to that wave, from 1890 to 1919, when Germany dominated as the country sending the most immigrants to many of the U.S. states, although the United Kingdom, Canada and Italy were also strongly represented. In 1910, Germany was the top country of birth among U.S. immigrants, accounting for 19% of all immigrants (or 2.5 million) in the United States. Germans made up the biggest immigrant group in 18 states and the District of Columbia, while Mexico accounted for the most immigrants in just three states (Arizona, New Mexico and Texas). After Germany, the largest share of immigrants in the U.S. came from Russia and the countries that would become the USSR (11%, or 1.5 million). Since 1965, when Congress passed legislation to open the nation’s borders, immigrants have largely hailed from Latin America and Asia. In states that have attracted many immigrants, the current share of immigrants is below peaks reached more than a century ago. In 2012, there were four states (California, New York, New Jersey and Florida) in which about one-in-five or more people are foreign born. California peaked in 1860 at 40%, when China was the top country of birth among immigrants there. Meanwhile, New York and New Jersey peaked in 1910 at 30% (Russia and the USSR) and 26% (Italy), respectively. Among U.S. immigrants as of 2013, five times as many are from Mexico as from China, where the second-highest number of U.S. immigrants were born (6% of all immigrants in the U.S., or 2.4 million). Mexico is the birthplace of 28% (or 11.6 million) of all immigrants in the U.S. Immigrants born in Mexico account for more than half of all of the foreign born in five states: New Mexico (72%), Arizona (58%), Texas (58%), Idaho (53%) and Oklahoma (51%). Despite Mexico’s large numbers, immigrants come to the U.S. from all over the world. India is the top country of birth among immigrants in New Jersey, even though only about one-in-ten of the state’s immigrants are from India. Canada is the top country of birth for immigrants in Maine (24%), Montana (21%), New Hampshire (15%), Vermont (15%) and North Dakota (13%). Filipinos account for a large share of immigrants in Hawaii (47%) and Alaska (27%). Note: This post was originally published on May 27, 2014, and updated on Oct. 7, 2015, to include 2013 data. Countries are defined by their modern-day boundaries, which may be different from their historical boundaries. For example, China includes Hong Kong, Macau and Taiwan. Russia and the former USSR countries are combined in this analysis, even though the Soviet Union was only in existence between 1922 and 1991. Birthplace is self-reported by respondents. Michael Keegan is a senior information graphics designer at Pew Research Center.